Journalists began hounding Columbia University for copies of the musty document. Conservative bloggers began wondering if the young Obama had written a no-nukes screed that he might come to regret. And David Bossie, the former congressional investigator and right-wing hit man, as one newspaper described him, took out classified newspaper ads in Columbia Universitys newspaper and the Chicago Tribune in March searching for the term paper. A thesis entitled Soviet Nuclear Disarmament, written at the height of The Cold War in 1983, might shed some light upon what Barack Obama thought about our most pressing foreign policy issue for 40-plus years (U.S.-Soviet Relations), he wrote in an e-mail to NBC News. "He barely mentions Columbia, training ground for the elite, where he transferred in his junior year, majoring in political science and international relations and writing his thesis on Soviet nuclear disarmament. He dismisses in one sentence his first community organizing job  work he went on to do in Chicago  though a former supervisor remembers him as 'a star performer.'" "he [Obama] declined repeated requests to talk about his New York years, release his Columbia transcript or identify even a single fellow student, co-worker, roommate or friend from those years. 'He doesnt remember the names of a lot of people in his life,' said Ben LaBolt, a campaign spokesman." IPSs [Institute For Policy Studies] Washington, DC headquarters quickly became a resource center for national reporters and a place for KGB agents from the nearby Soviet embassy to convene and strategize. Cora Weiss headed one of the IPS's most successful forays -- into Riverside Church in Manhattan. She was invited there in 1978 by the Reverend William Sloane Coffin to run the church's Disarmament Program, which sought to consolidate Soviet nuclear superiority in Europe -- in the name of "peace." In 1982 Weiss helped organize the largest pro-disarmament demonstration ever held. Staged in New York City, the rally was attended by a coalition of communist organizations. During her decade-long tenure at Riverside, which became home to the National Council of Churches, Weiss regularly received Russian KGB agents, Sandinista friends, and Cuban intelligence agents. Weiss became infamous for her role in the psychological warfare conducted against U.S. prisoners of war held in the infamous "Hanoi Hilton" during the Vietnam War. The Liberation News Service, which is a news source for hundreds of "alternative" publications nationwide (with antiwar, Marxist-oriented perspectives), was founded in 1967 with IPS assistance." The Riverside Church is located on Manhattans Upper West Side near Columbia University. In 1982 Weiss helped organize the largest pro-disarmament demonstration ever held. Staged in New York City, the rally was attended by a coalition of communist organizations." "Obama attended Columbia College from 1981 to 1983"
Bank Street College is located on the Upper West Side of Manhattan at 610 West 112th Street, between Broadway and Riverside Drive. Why Wont Obama Talk About Columbia? "But by the time I met Frank [Frank Marshall Davis] he must have been pushing eighty, with a big, dewlapped face and an ill-kempt gray Afro that made him look like an old, shaggy-maned lion. He would read us his poetry whenever we stopped by his house, sharing whiskey with Gramps out of an emptied jelly jar." Barack Obamas childhood mentor, Frank Marshall Davis, a member of the Moscow-controlled Communist Party USA (CPUSA), wrote a poem dedicated to the Soviet Red Army. Smash on, victory-eating Red Army, he declared. He also wrote poems attacking traditional Christianity and the work of Christian missionaries. How can the US press still ignore the fact that Obama refuses to release his college transcripts/grades? We have all of the president’s grades from Clinton through Bush even presidential candidates grades like Sen. Kerry and Algore. Even for historic reasons, this is a missing link for the future Obama presidential library. 1) We know nothing about Obama’s previous life other than what he wrote about in two autobiographies. 2) We know of none of Obama’s college friends. 3) We know of none of Obama’s former girlfriends. 4) We know nothing about Obama’s foreign travel except for a reference to a trip to Pakistan when it was prohibited for US citizens to travel there. 5) We know nothing about Obama’s Selective Service registration when the press spent thousands of hours on Bush’s National Guard service. The silence is deafening by the press and it is very telling that there is some skeletons in that Obama closet. The Obama toadies are obviously hiding a lot of stuff. I thought theses were the property of the universities, and were usually preserved. There are Many skeletons in the Obama closet. I suspect like other globalists, Madame Halfbright included, that he was against the US being the only super power as we weren’t to be trusted. They wanted the Soviets, now Russia, to have the bomb to balance our power. The first bilateral Peace Mission maneuvers -- described at the time as counter-terrorism exercises -- were held in Russia and the eastern Chinese province of Shandong in August 2005. As we reported at that time, they were a lot bigger than mere counter-terrorism exercises. Warships, squadrons of combat aircraft and more than 10,000 troops were involved carrying out landings against hypothetically hostile shores. The maneuvers also involved large-scale paratroops drops. The scale and nature of those exercises suggested a trial run for a possible Chinese invasion of Taiwan with Russian support. ..."
CHEBARKUL, Russia (Reuters) - Russia and China staged their biggest joint exercises on Friday but denied this show of military prowess could lead to the formation of a counterweight to NATO. "Today's exercises are another step towards strengthening the relations between our countries, a step towards strengthening international peace and security, and first and foremost, the security of our peoples," Putin said. Fighter jets swooped overhead, commandos jumped from helicopters on to rooftops and the boom of artillery shells shook the firing range in Russia's Ural mountains as two of the largest armies in the world were put through their paces. The exercises take place against a backdrop of mounting rivalry between the West, and Russia and China for influence over Central Asia, a strategic region that has huge oil, gas and mineral resources. Russia's growing assertiveness is also causing jitters in the West. Putin announced at the firing range that Russia was resuming Soviet-era sorties by its strategic bomber aircraft near NATO airspace. In foreign policy its critical to know thine enemy. So American policymakers should be aware that Russia and China are inching closer to identifying a common enemy  the United States. The two would-be superpowers held unprecedented joint military exercises Aug. 18-25. Soothingly named Peace Mission 2005, the drills took place on the Shandong peninsula on the Yellow Sea, and included nearly 10,000 troops. Russian long-range bombers, the army, navy, air force, marine, airborne and logistics units from both countries were also involved. Moscow and Beijing claim the maneuvers were aimed at combating terrorism, extremism and separatism (the last a veiled reference to Taiwan), but its clear they were an attempt to counter-balance American military might. That's because it is all about HIM. He could care less about anyone else. Not his mother, father, grandmother. Not his poor African relatives. He CERTAINLY does not care about America and its people. He doesn't REALLY care about ANYONE but himself. ANYONE that gets in his way or criticizes him. He NEEDS to fall on his sword, or somehow prevented from destroying our country. This is a wild goose chase. Invest your time more prudently. The last time this came up, it became clear that he did not write an undergrad thesis because Columbia did not require one. He apparently wrote a term paper on this topic, but term papers are turned in only to the teacher of the class for which they are written and that professor didn’t keep a copy. So, unless Obama kept a copy himself, it’s probably impossible to locate. And even if located, it’s a damn term paper, not a BA thesis. Universities don’t keep official copies of term papers. I don’t doubt for a moment that he hung around with radicals during the period of his life. But you’re not going to shed any light on it via this phantom undergrad thesis. So give it up already. 9 posted on 03/31/2009 6:52:36 AM PDT by Houghton M.
Obama did not attend "Columbia College." He attended Columbia University's "School of General Studies." This is an alternative program run by the University and has evening seminars" and "special programs", intended for part-time, or working students. It's OK, but it ain't "Columbia College." Pretty much "walk-in" admission. Hardly a soul in Columbia College Class of '84 even knew Obama. IMHO, the "thesis" about "Nuclear Disarmament" is disinformation. What Obama was really into at Occidental and at Columbia was "Black Power" studies. Whether or not Obama knew Ayers in NYC is a good question. They ran in the same circles. 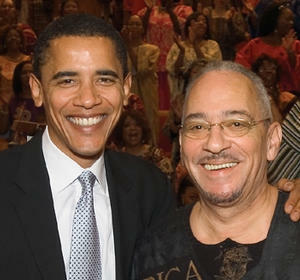 Start with, "Mr. POTUS, when did you meet Bill Ayers?" Betcha the FBI knows. Also note that Bernadine Dohrn's sister was a big gun at Columbia in those days, smoothing the way for Obama and Ayers. There is also a mystery surrounding his acceptance at Harvard Law School. Rumor has it that his academic performance was not very good and that the LSAT was "waived" for him. He was Law Review at Harvard, but there is also some controversial discussion surrounding that, as well. Obama has successfully stonewalled most inquiries about his life, pre-Chicago and Illinois Legislature. All he wants us to know is in "Dreams of My Father." That book, literary analysts claim, was possibly ghost-written by Bill Ayers. Its style, vocabulary, sentence structure, philosophy and story line are eerily similar to Ayers' other works. "written at the height of The Cold War in 1983"
Apart from The Soviet Union almost launching a Mutally Assured Destruction missile launch at the US, I wouldn't say things were at the HEIGHT. That is unless you hold to the Left's position that Ronald Reagan was a reckless cowboy who antagonized the Communists and almost brought on WWIII (truth of the matter is that the Cold War WAS WWIII). The Left believed that we could not and SHOULD NOT defeat the Communist Soviet Union. We should learn to accept Communism as a rational and legitimate political system (like Nazism?). IMHO, the "thesis" about "Nuclear Disarmament" is disinformation. What Obama was really into at Occidental and at Columbia was "Black Power" studies. The New York Times reported as a 'throwaway' comment that he wrote his "thesis"/term paper on Soviet nuclear disarmament. What do you think the "Black Power" movement is? It's part of the "Black Liberation" movement. "Their founding document [the Weather Underground's] called for the establishment of a "white fighting force" to be allied with the "Black Liberation Movement" and other "anti-colonial" movements to achieve "the destruction of US imperialism and the achievement of a classless world: world communism."... "-Berger, Dan (2006). Outlaws of America: The Weather Underground and the Politics of Solidarity. AK Press, 95. "they [the Weather Underground] employed revolutionary jargon, advocated armed struggle and black liberation and began bombing buildings, taking responsibility for at least 20 attacks. Estimates of their number ranged at times from several dozen to several hundred." "FBI files from 1976, recently made public under the Freedom of Information Act, confirm the connections between Weatherman, Havana, and Moscow. Weatherman leaders like Mark Rudd traveled illegally to Havana in 1968 to engage in terrorist training. There, camps set up by Soviet KGB Colonel Vadim Kotchergine were educating Westerners both in Marxist philosophy and urban warfare." You didn't find *anything* informative in this post? You responded like someone from the Obama camp or left-wing media. Amen. This and the birth certificate topic are really sad (but understandable instances) of flights of desperate fantasy. It is no wonder people hope for some miraculous unveiling of Obama which will send the country immediately back into Conservative arms, but I think Rush has the right idea; it is just going to take a long time in rebuilding the Conservative movement, and it will be against the odds most of the way, barring some event which sends people irrationally back as the pendulum swings our way. We can’t wish an old, possibly goofy, and likely poorly written college paper written by anyone into becoming that kind of game-changing influence on the nation. Hillary Clinton’s old college papers have certainly not ended her career. We cant wish an old, possibly goofy, and likely poorly written college paper written by anyone into becoming that kind of game-changing influence on the nation. Who said this alone would be such a thing? It's simply another telling piece in the puzzle.
. During her decade-long tenure at Riverside, which became home to the National Council of Churches, Weiss regularly received Russian KGB agents, Sandinista friends, and Cuban intelligence agents. Weiss became infamous for her role in the psychological warfare conducted against U.S. prisoners of war held in the infamous "Hanoi Hilton" during the Vietnam War. Wonder if the national council of churches is still located here...it was instrumental in forcing Elian back to Cuba during the clinton reign of terror and my church at the time, United Methodist, was a big contributor (member) of this sick council. I left the Methodist Church because of this affiliation. Did I say I found nothing informative? All of the pile of stuff could have been posted under the rubric, “Obama’s Radicalism.” That would be fine with me. I specifically urged not to go down the rabbit hole of Obama’s phantom undergrad thesis. Once you get that through your head, then post all the other stuff about how radical he was and is. But stop it with the conspiracy-to-hide-Obama’s-undergrad-thesis crap. 20 posted on 03/31/2009 7:43:38 AM PDT by Houghton M.